← Merry 12 Days of Christmas! New Year’s Eve is the 7th day of Christmas; the two holidays go together. Only in the mystery of Christmas, the Incarnation, the babe in Bethlehem, lies the answer to all our hopes and fears for years past, present and future. What a difference it makes, looking back upon a passing year and forward to the new, to know and be confident in the love of God! Everything about our uncertain world looks different in that light. As Joseph understood when facing the wrath of Herod and the uncertainties of Egypt, the babe in the manger was nothing less than Immanuel, God with us, an undying light of hope in the midst of our dark and fearsome world. God’s love for us is truly boundless in Christ, a babe in the dark streets shining, Immanuel. Therefore, like Bonhoeffer, Roosevelt and Churchill, we take confidence that no adversity in the new year ahead shall overcome us. In this sure hope and confidence, we wish you all a Happy New Year! 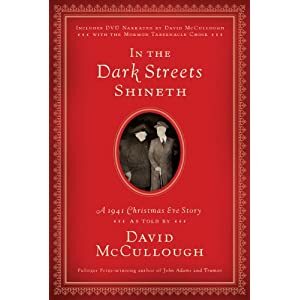 This entry was posted in Theology and tagged Christmas, David McCullough, Dietrich Bonhoeffer, Holidays. Bookmark the permalink. That was a great DVD. I can’t wait to take a closer look at Mom and Dad’s book.